Between each block, the Expedition completes traverse sections. During these traverse period, most members of the Expedition are focused on all the logistic tasks required to switch camps. Over several days, an opening crew goes ahead to open the next camp, trail parties do the one- to two-day trip, and a closing crew closes the last camp for the winter. A few small groups will continue doing research during these days, but it’s important for the majority of the participants to be prepared to pitch in on the many opening and closing chores, and to be as flexible as possible about issues like unusual food selections and sleeping arrangements, and being separated from your non-essential personal gear while it’s transported via helicopter or snow machine. Block 1 Faculty will do the Juneau-to-Camp 17 Traverse. Block 2 Faculty may do the Camp 10-to-Camp 18 Traverse (depending on snow conditions). Block 3 Faculty may do the Camp 10-to-Camp 18 Traverse (depending on snow conditions). Block 4 Faculty will do the Camp 18-Camp 26-Atlin Traverse. Faculty who join the Expedition for multiple, consecutive blocks will be expected to do the traverses between those blocks. Because of the technical nature of the Camp 17-to-Camp 10 Traverse, we will allow only faculty with prior JIRP experience or significant prior mountaineering experience to apply for this. Final sign-off for faculty for this traverse is the decision of the Program, Operations, and Safety Managers. A trail party crosses treeline and hikes up into the grassland on the way from Juneau to Camp 17. Photo: Daniel Otto. The hike from Juneau up to Camp 17 is a one- to two- day hike through the rainforest, grassland, rocky periglacial zone, and up the small Ptarmigan Glacier. The trip begins in town, behind the Home Depot in Juneau. By the end, students are perfectly positioned at Camp 17, at the very edge of the Juneau Icefield. Much of the five-day Juneau Orientation Week focuses on preparing for this hike. A trail party ascends the Norris Icefall at the end of the first day of the Camp 17-to-Camp 10 traverse section. This is one of several technical sections of the trip. Photo: Daniel Otto. The Traverse from Camp 17 to Camp 10 is a two-day trip that uses all the skills from Safety Training. Small groups of six students and two staffers ski, crampon, and hike their way down the Lemon Creek Glacier, up to the Thomas Glacier, across Nugget Ridge, down to Death Valley, and up the Norris Icefall. At the top of the Icefall, everyone spends the night at the Norris Cache, a tent camp supported via snow machine from Camp 10. Day two is a long, straight, slightly downhill cross country ski down the Southwest Branch of Taku Glacier and across Taku Glacier itself, ending in a short hike up the Camp 10 nunatak. The majority of students, staff, and faculty ski the 18 miles from Camp 10 to Camp 18 in one day. This is the most moderate traverse day of the summer. Compared to our other traverse sections, it covers relatively few technical sections and almost never involves crampons until the very last half mile into Camp 18. The day takes anywhere between eight and 12 hours, and safety concerns largely revolve around pacing and blister care. Skiing down the Llewellyn Glacier to snowline. The black dot in the middle ground is the cache of crampons and food and the supplies to be carried to Camp 26. Photo: Daniel Otto. Trail parties ski from Camp 18, up and over the Divide, and down to snowline. 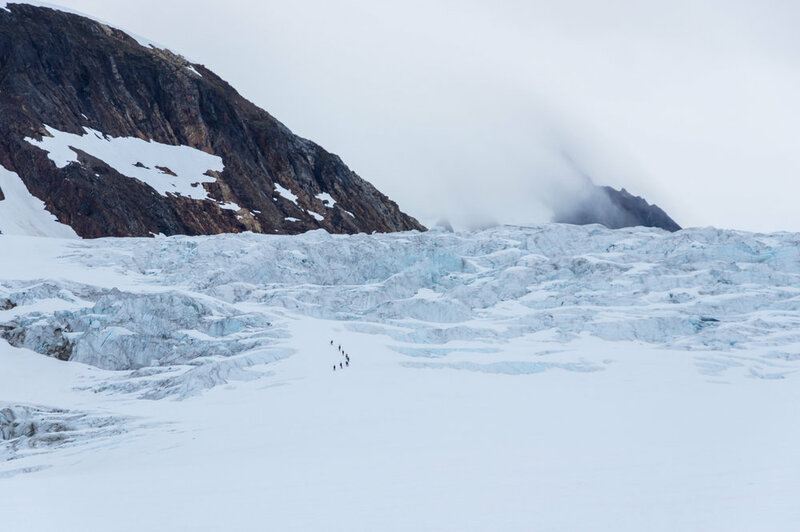 Here they change from skis to crampons and hike the final few miles over the blue ice to Camp 26. Participants who are continuing on to Atlin carry their skis from snowline to Camp 26 (and then to Atlin). Block 3 faculty who are flying out of Camp 18 will re-trace the route on the return trip and can leave their skis at snowline. A trail party hikes out of the supraglacial streams and bare, blue ice of the lower Llewellyn Glacier on their way to Atlin Lake. Photo: Daniel Otto. Trail parties hike or crampon over the blue ice from Camp 26, down the Llewellyn Glacier, over the side of Red Mountain, and out the proglacial zone to the forest and camping on the shore of Atlin Lake’s Llewellyn Inlet. The following day participants take a two-hour small boat ride up Atlin Lake to the town of Atlin. Note: At the close of Block 3, the majority of the Expedition is still working out of Camp 18. As we close Camp 18, to streamline logistics, we fly as much research and personal equipment out to Juneau as possible. Each trail party, staggered over several days, does the trip from Camp 18 to Atlin in four days, including one rest day at Camp 26.